It hasn’t, and it likely won’t. But 20 years ago, the view was nearly universal. Japan’s economy was breathtaking — rapid growth, innovation, and efficiency like no one had seen. From 1960 to 1990, real per-capital GDP grew by nearly 6%, double the rate of America’s. But then it all stopped. Japan’s economy isn’t the scene of decline some depict it as, but its growth slowed to a trickle at best. You can write volumes of books analysing Japan’s decline (and some have), but one of the biggest contributors to its stagnation is simple: It got old. The story begins, as so many about the modern day do, with World War II. Japan’s toll in the world war was among the highest as a percentage of its population. Some estimate 4.4% of the Japanese population died in the war (the figure is 0.3% for the United States). Demographically, two things resulted from that population shock that would shape the country’s economic fate for the next half-century. Like America, Japan underwent a “baby boom” immediately after the war as returning soldiers married and families were rebuilt. More than 8 million Japanese babies were born from 1947 to 1949 — a staggering sum given a population of around 70 million at the time. [In] the terrible winter of 1945-6 … newly bereft of their empire, the Japanese nearly starved to death. With overseas expansion no longer an option, Japanese leaders determined as a top priority to cut the birthrate. Thereafter a culture of small families set in that has continued to the present day. This created an extreme bulge in the country’s demographics: a spike in population immediately after the war followed by decades of low birthrates. As Japan entered the 1970s and 1980s, the baby boom generation — called “dankai,” or the “massive group” — hit their peak earning and spending years. They bought cars, built houses and took vacations, helping to fuel the country’s economic boom (which turned into an epic bubble). Observers like Thurow ostensibly extrapolated that growth and became dewy-eyed. But as the 1990s rolled around Japan’s dankai not only waved goodbye to their prime spending years, they crept into retirement. Consumption growth dropped and the need for assistance rose. Meanwhile, the small-family culture endured. Japan’s birth rate per 1,000 people has averaged 12.4 per year since 1960, compared with 16 per year in the U.S, according to the United Nations. Combine the two trends, and Japan’s aging population has created a demographic brick wall that has kept economic growth low for the last two decades, and will likely worsen for more to come. Adult nappies outsold baby nappies in Japan last year for the first time ever. There’s your sign, as they say. Lesson learned: Keep an eye on demographics. Age distribution is hardly the end-all driver of future growth, but it plays an important role. 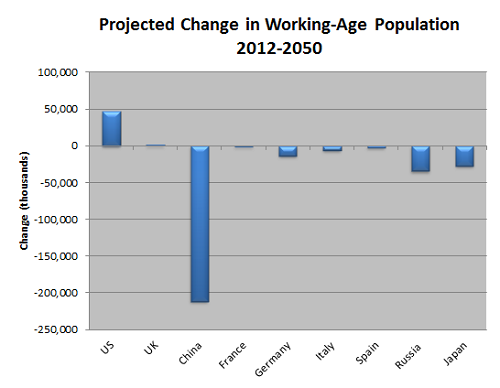 You could do worse than gauging a country’s economic fate simply by looking at its demographic projections. Dig through international demographic projections, and one thing becomes shockingly clear: The United States is in a much better position than nearly all other major economies. Predictable. China has a young population teaming with potential workers. The U.S. is slightly behind. Old-world Europe is a bit grayer. Japan is the wrinkliest of the bunch. For perspective, the U.S. is on track to grow its working-age population by the equivalent of six New York cities between now and 2050. China is on track to lose the equivalent of three United Kingdoms. Those, folks, may be the most important numbers of the next half-century. Look around at commentary today. It’s a predictable dose of tombstone preparation for the U.S. economy and trumpets hailing the arrival of China as the world’s new superpower. Will we one day look back on these assumptions with the same amusement we now give Thurow’s prediction for Japan? I wouldn’t doubt it. “The trick is growing up without growing old,” baseball great Casey Stengel once quipped. That’s true for countries, too.